After three years of sharing the rights to the NCAA Men’s Division I National Basketball Tournament, CBS and Turner Sports have agreed to accelerate their transition game. 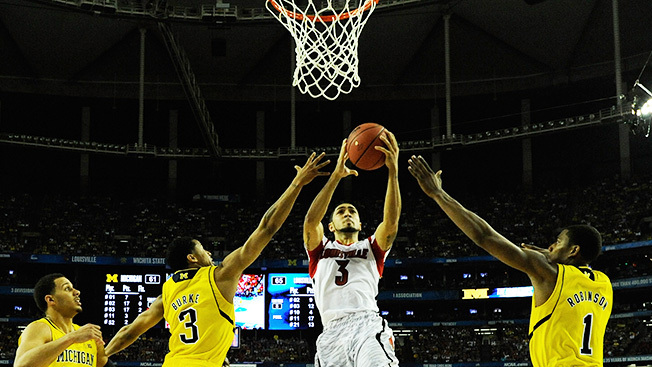 Beginning in March 2014, TBS will begin carrying the two national semi-final games, better known as the Final Four. Per terms of the original pact, TBS was to begin hosting the Final Four in 2016. The revision of the April 2010 agreement ensures that yet another high-profile sporting event is making the jump to cable. In 2016, for the first time in the tournament’s storied history, the National Championship game will be telecast on a basic cable network. From that moment on, CBS and TBS will alternate stewardship of the title tilt. Per Nielsen live-plus-same-day data, the 2013 Final Four was the most-watched since 2005, averaging 15.7 million viewers and a 9.4 household rating, up 3 percent from the previous year. The late game (Michigan-Syracuse) was the biggest draw, averaging 17.1 million viewers and a 10.2 HH rating. As is generally the case, the championship game scared up a big crowd, as Louisville’s 82-76 win over Michigan drew 23.4 million viewers. While consumer advocates are likely to decry college hoops’ biannual slide from free TV to cable, the distribution gap is growing narrower with each passing year. TBS reaches 99.2 million homes, or 87 percent of the nation’s 114.2 million TV households. The Final Four and National Championship Game join a long roster of sports franchises that now call cable home. These include the BCS Championship Game (ESPN), the MLB’s American League and National League Divisional Series and alternating League Championship Series (TBS), the NBA Playoffs (ESPN and Turner) and Games 3 and 4 of the Stanley Cup Finals (NBC Sports Network). March Madness is big business, with an average 30-second spot in this year’s Final Four commanding as much as $1.1 million, while a unit in the title tilt fetched upwards of $1.6 million. All told, this year’s 67-game tournament generated an estimated $875 million in ad sales revenue. Under the terms of their 14-year, $10.8 billion contract with the NCAA, CBS and Turner share all expenses and revenues associated with the tournament.